I fix the problem of layering by printing on card stock and cutting out the outfits without tabs. Then I lay the doll on a flat surface and play with her like a magnetic paperdoll. It makes mixing and matching very quick and saves time cutting out. The downside is you can’t move the paperdoll around after dressing her but I mostly just enjoy dressing the dolls and trying lots of outfit combinations. hahaha ~ like Elizabeth said…and that’s reason 187 why i don’t make tabs. i love love love the rich yellows and greens! and all your patterns on this one are fabulous. Yeah, I know a lot of people don’t like tabs, but I just really do. I mean… maybe I have a problem. I think that if you are going to have a paper doll than her clothing should stay on when she’s standing up. Plus I think it is a lot easier to cut off tabs than add tabs. it’s definitely not a problem! just a different way of playing. 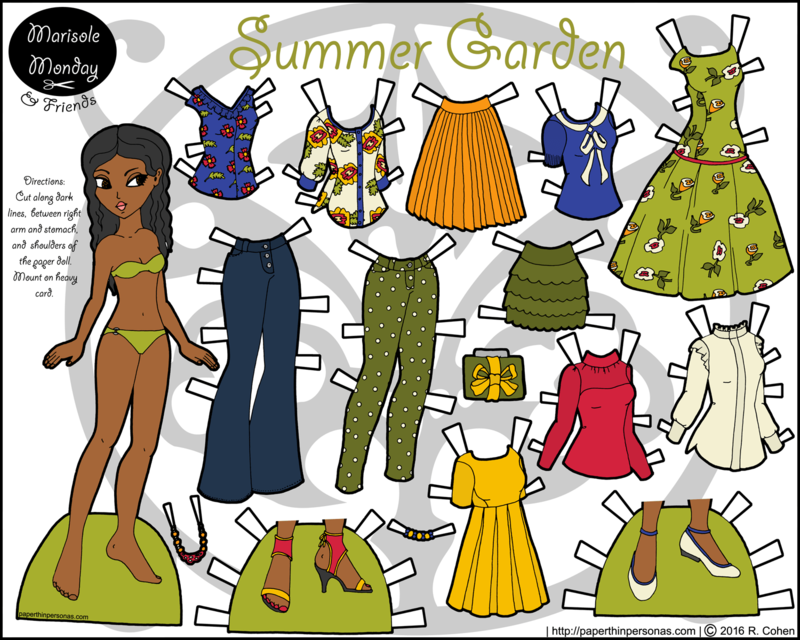 i’ve always played with my paper dolls flat (they’re just easier to work with that way because you don’t have to worry about knocking then down or their clothes falling off. i also have a horror of folded paper, so bent tabs make my skin crawl ~ hahaha. Me and my sister laminate paper dolls we cut the tabs off of and use poster puddy to attach them! The colors in the this set are all just about perfect. Her hair, skin, and wardrobe choices are really beautiful color combinations. I use an razor to cut between the arm and the stomach too, but maybe just redrawing the offending arm (Bad! Bad! Arm!) would be the simplest solution. I was thinking about it because recently I was working on some dresses and the layering problem became very apparent to me.